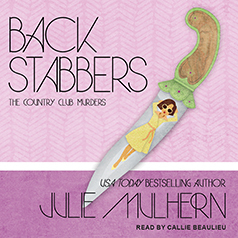 Julie Mulhern presents the eighth book in the Country Club Murders series. All Ellison Russell wanted was an update on her stock portfolio. Instead, she found her broker dead. With an unexpected out-of-town guest at her house, Ellison is too busy for a murder investigation. Only this time, Detective Anarchy Jones wants her help, and she can't deny the handsome detective. Can Mr. Coffee supply her with enough caffeine to keep her brain sharp and everyone else happy? Juggling bodies (one, two, three, four), two-faced friends, her social calendar, and a cat (yes, a cat) is taxing but Mother might be the biggest challenge of all. With a killer drawing closer, can Ellison put together the pieces or will she be the one getting stabbed in the back?